As I am typing this post I am listening to the BBC World Service report of the battle at Mosul, where Iraqi and Kurdish troops advance toward a city full of innocent civilians and IS fighters. Here in Chicago the murder toll is 582 people and counting. My email inbox is full with requests from people’s campaigns to stop violence or to aid those caught in it. With this as my backdrop I sit in my comfortable home, with a cup of warm tea, thinking about a blog post for this Civic Fellows’ page. We, the Civic Fellows, have had a very eventful start to the 2016-17 season. We began our residency on September 7th with an incredibly well-presented tornado of orientations, events and ideas. Our group took an architecture boat tour around the city as a bonding experience and as an opportunity to understand our city and its rich history more deeply. At the end of September we were privileged to attend an eye-opening performance at a juvenile correctional facility, Illinois Youth Center – Chicago. 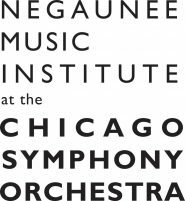 The performance was led by Maestro Riccardo Muti and featured artists from the Chicago Symphony Orchestra. This experience continues to raise many thoughts and questions in our ongoing discussion of community engagement. The following day was an open rehearsal with Maestro Muti and then the Fellows’ chamber concert a day after that. The Civic Fellows have had the opportunity to join The People’s Music School at a few different schools around the city. Most of us teach group or individual lessons at these schools and we receive training from the People’s Music School on how to more effectively train young musicians. At the beginning of October we were privileged to join the Apostolic Church of God’s music program where we coached sectionals and performed a concert with some incredibly talented young musicians. All of these opportunities to observe, to educate, to listen, to reflect, and to perform have taught me things about myself, about my community, about art, and about the overall impact that beauty can have in both subtle and massive ways in people’s lives. My roses for today are (1) woodshed that F to G slur at the top of the staff, (2) teach my students in Albany Park: Eric, Emmanuel, Kaylynn and Gerson, (3) fit into the texture of our terrific orchestra and make some beauty tonight at the Civic Orchestra concert. Every time we pick up our instruments we are painters picking up our brushes to add something of beauty to this canvas. There is a thread of beauty running through this mess and there are constant pulsing glimmers of hope.